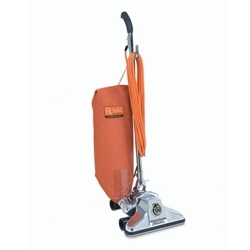 Each Royal Commercial All-Metal Upright comes with either a 14” or 18” bell-shaped nozzle and a curved, double row ball bearing revolving brush with stiffener to pick up deep down dirt other vacuums leave behind. Available in several models, there is sure to be a Royal Commercial All-Metal Upright that will meet your needs. Choose between an infinite screw Adjust-O-Rite or 5 position foot pedal for precisions height adjustment on all types of carpet. If you prefer a bagless vacuum cleaner, each upright is also available in denim, top-fill shake out bag (except the M1059). With Royal Commercial All-Metal Uprights, you will get high performance, superior cleaning power and affordability all backed by the longest warranty in the industry; Lifetime Warranty on the nozzle, fancase and motor housing and 2 Year Limited Commercial Warranty. Be sure to look for our models that are CRI certified! High filtration outer bag system with HEPA-type paper bag traps 99.9% of dust and pollens as small as 1 micron, leaving only clean air behind. Dust bags are also available in Royal-Aire and HEPA material. 2 year limited commercial warranty. Lifetime warranty on nozzle, fancase and motor housing. Orange denim shake-out bag with top fill bellows. Orange denim shake-out bag with top fill bellows.Adjust-O-Rite button identifies proper nozzle setting, helping you achieve maximum airflow and brush agitation.